How do I change the Live Data Graph to be a complete hour? I need to see that degree of granularity. the time period shown in the Live Graphs depends on the scanning interval of the sensors. By default the live graphs (and tables) contain 120 monitored values, which cover 2 hours with a scanning interval of 60s. The amount of displayed values can be increased up to max. 960 values, using the PRTG Server Administrator (Tab 'Memory Usage'). To set it to a fixed time period is not possible. I am running 7.3.2 and don't find the tab you reference. 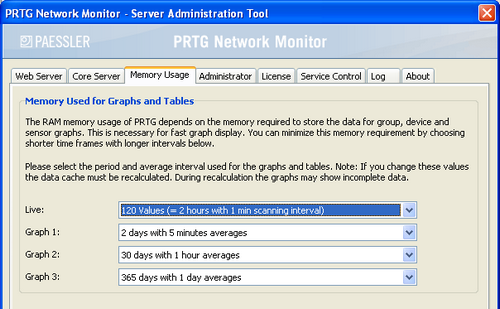 The "PRTG Server Administrator" can be started from the "PRTG Network Monitor" program group in the Start Menu and allows configuring basic server settings. It is divided into eight tabs, one of them is labeled "Memory Usage" in the english version. In current versions (2016) this functionality has been moved to the normal web-interface under: Setup -> Administration -> User Interface -> Bottom of page @ "Graph Settings"
Steven, while your API call suggestion should indeed work, this may change in the future as it is not an officially documented API call. Your call should be used as a POST request though, which it is internally within our forms in the web interface.